Random Acts of Kindness Week 2018 begins; You can help participate! It’s the second week of February, and you know what that means: Random Acts of Kindness Week! On Monday, January 15, 2018, Martin Luther King Jr. Day will be observed in the United States and in several countries throughout the world. The day is held in remembrance of the late civil rights leader, who would have turned 89 years old on this same day. Merry Christmas & Happy Holidays From Rainbow Rabbit! 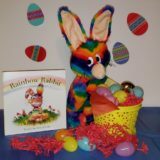 After spreading his lessons of kindness and caring in 2017, Rainbow Rabbit is celebrating this Christmas/holiday season.